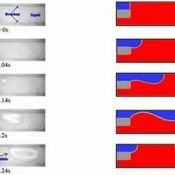 Unlike continuous microfluidics, droplet based microfluidics manipulates only discrete volumes of fluids. 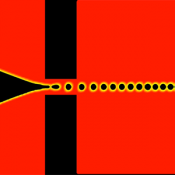 Microscale droplet systems can also allow for high throughput if there is a deep understanding of the droplet dynamics. 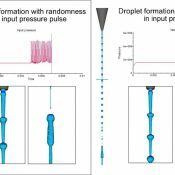 Computational fluid dynamics is a very useful tool for understanding and predicting the behavior of such systems. 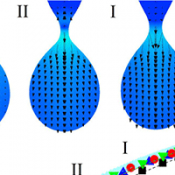 The study of droplet dynamics through numerical simulations has been instrumental in the proliferation of inkjet technology. Over the last decade, FLOW-3D has been established as the preferred analysis tool for such studies, for both commercial and academic applications. 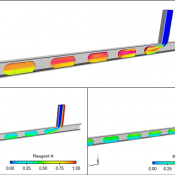 FLOW-3D has been used to study acoustically induced inkjets, piezo inkjets, thermal bubble inkjets and many other types. Equipped with a powerful surface tension model and a successful history of inkjet modeling, FLOW-3Dnaturally extends to modelling droplet based microfluidics processes. FLOW-3D is nowadays used to simulate precision droplet creation, precision droplet deposition, droplet merging, droplet breakup, droplet motion, flow focusing, inkjet printing and droplet T-junctions among other applications.